In Spain, a tortilla is not one of those delicious lard-and-flower jobs that wrap our burritos. Rather, it is a thick potato omelet. Tortillas can be be made with any number of meats or vegetables as a filling. 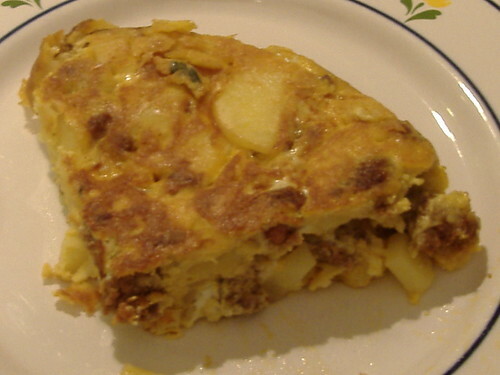 But rather than cooking the eggs and wrapping the fillings, the fillings are all cooked into the tortilla. It makes for a delicious meal, but when you’re cooking a pound of potatoes, a half pound of chorizo, and a whole onion in a 7-egg omelet, all cooked in a heavy, cast iron skillet, flipping the beast is a bit of a challenge. I was anticipating the challenge while making my first tortilla this weekend. I’ve read that it takes a lot of practice to master the art of flipping the tortilla. After the eggs had set enough, it was time for the first flip. I was nervous. The flip involves cover the skillet with a plate, flipping the tortilla onto the plate, and then carefully sliding the tortilla back into the skillet so that the upside is now down. I managed the first flip without any damage, doing a little victory dance before sliding the tortilla back into the skillet. The second flip caused a minor crack, but the final flip onto the serving plate went off without a hitch. It’s actually quite a simple dish, but nailing the flip was one of my proudest culinary achievements yet. I can attest to the victory dance.